Just a few observations on the first days of school...five short days. So much enthusiasm, so much curiosity, so much joy. In many ways it didn't feel like the beginning of the school year at all, more like we had all been dropped in mid-year, returning kids seemed to just pick up where they had left off last Spring and new kids went right to work figuring out what was what and what to do with it. It has been a joy to watch the older children teach the new ones how to get up on the climber, how to get on and off the swing, how to catch a chicken, and so much more. Kids have made mud, played in the water, dug a river, picked tomatoes, painted, and made structures out of blocks, magna-tiles, and bamboo poles. Kids have been remembering routines and learning new routines. We've learned at least 10 new songs and read and talked about at least 6 books. Kids have reconnected with old friends and made new friends. One of my sons favorite things about Room to Grow preschool is the outside area. It's the first thing he plans out that he will do before school and it's the first thing he shares with me when I pick him up. Recently he has become very interested in the worm bin, and makes it part of his plan each day to either check on them, hold them or feed the worms. The worm bin itself is such an amazing example of the natural processes in which students get to really explore at school. By checking it weekly, he has understood how worms break down food and process it to make fantastic fertilizer for the garden. One of the days I was participating he asked me: "where are the worms mouths and how do they chew the food?" I was just a little floored that he was asking such a thoughtful question. 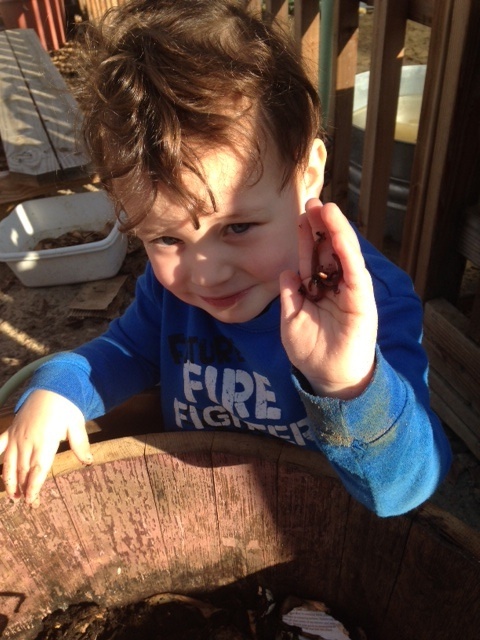 I think a big part of his love of the worm bin is how they "tickle" his hand and in figuring out where they are in the bin. It's opened up a huge area of exploration for us in regards to other bugs and how they help gardens too. The level of science he is learning and applying is just astounding. Z, A & Z shredding paper for the worm bin after the rain. This is a space for parents and teachers to share their experiences and their children's experiences at Room to Grow.